For harsh operating conditions, you need robust network components. With their managed switch product portfolio, Hirschmann offers highly flexible, long-lived products designed specifically for use under extreme conditions. You are equipped with the best when you choose Hirschmann switches. 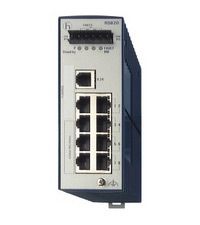 Hirschmann managed switches are easy to configure with an integrated passwordcontrolled web interface, via SNMP or CLI (command line interface), providing secure remote configuration through the network. Continuous product innovations meet expanding customer needs - from Gigabit industrial profiles to IP67 industrial watertight switches to the integration of a USB port to facilitate quick recovery of both switch and network. Learn more about these outstanding products from Hirschmann by clicking on the links below. To discuss your particular solution with one of our Engineering Specialists, contact us at 1-866-599-6519. Complete solution for extreme environmental conditions (OCTOPUS family). For robust outdoor applications as well as in hazardous areas (BAT family).